Tag line: "Houston's other problem"
Is it possible to recapture the magic of an event that occurred more than 45 years ago? This is exactly what the makers of 2000’s The Dish set out to accomplish, and I’m pleased to report they succeed at every turn! It’s July of 1969, and as three American astronauts hurtle through space in the Apollo 11 pod, the world below them is glued to their television screens, waiting for the moment when mankind first sets foot on the moon. The good folks at NASA are fully prepared for this historic undertaking, but need a little help from their friends Down Under to make sure it goes off without a hitch. Specifically, they’re relying on the radio telescope located in Parkes, Australia, the largest in the Southern hemisphere, to broadcast the live images of astronaut Neil Armstrong’s moon walk. So, with the eyes of the world on them, the array’s 3-man crew, Supervisor Cliff Buxton (Sam Neill), Engineer Mitch Mitchell (Kevin Harrington) and Mathematician Glenn Latham (Tom Long), works closely with NASA representative Al Burnett (Patrick Warbutron) to ensure they’re ready for the big event. Everyone in Parkes is proud as hell to be part of this momentous occasion, especially Mayor Bob McIntyre (Roy Billing), the man responsible for bringing the dish to Parkes in the first place. But is the Parkes crew up to the challenge, or will a combination of bad luck and even worse weather foul up their moment of glory? 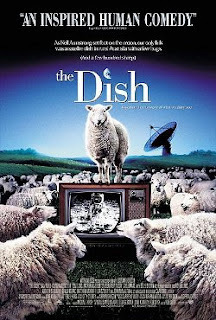 The Dish, which is loosely based on actual events, works quite well as a comedy; during a dance at the local high school, A teenage rock band attempts to perform the U.S. National Anthem in honor of the American Ambassador (John McMartin), who’s in attendance. Unfortunately, they learned the wrong tune, and end up playing the title theme from Hawaii Five-0 instead! The film also has its share of drama. When the power goes out momentarily in Parkes, the array’s computer is reset, and as a result they sever their link with Apollo 11, and have no idea how to get it back. It’s a tense sequence, to be sure, and is followed by an even greater threat: driving winds, which coincide with the scheduled moon walk. Should they move the array to pick up the video feed from the moon, the strong gusts could cause the dish to topple over, killing everyone inside. Do they take such a risk, or lose their chance to make history? Yet as good as these scenes are, the true magic of The Dish lies in the way it recreates the anticipation, as well as the wonder, that gripped the entire world during those few days in July of ‘69. Utilizing actual NASA footage as well as dozens of authentic news reports from the time period, the filmmakers allow us to see the landing through the eyes of the movie’s characters, who sit in awe of what they’re witnessing. Like the rest of the world, the citizens of Parkes gathered around their televisions to see history in the making, and we get caught up in the excitement right along with them. A funny, touching film with well-realized characters, The Dish is at its best when it’s stirring our emotions, and even though we know how the moon landing is going to end, we cheer all the same. This is a terribly underrated film. I've seen it a couple of times and have enjoyed it every time I've seen it.